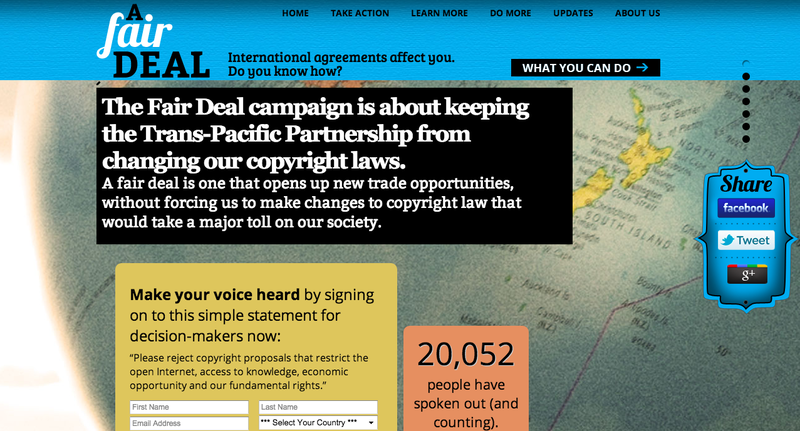 The web presence at Our Fair Deal.org acts as an educational resource and clearing house for member material [Image 6]. To facilitate information and strategy sharing, joint letters and outreach collaboration, OpenMedia hosts several mailing lists and regular conference calls. 18. FairDeal coalition members include: Affinity Bridge, Article 19, Australian Digital Alliance, Australian Library & Information Association, Association for Progressive Communications (APC), Internet NZ, BCFIPA, The Canadian Internet Policy and Public Interest Clinic (CIPPIC), Consumers International, Consumer NZ, Council of Canadians, Creative Freedom, Demand Progress, Derechos Digitales, Electronic Frontiers Australia, Electronic Frontiers Foundation (EFF), Engine.is, Fight for the Future, FreePress, Gen Why Media, Hiperderecho, Library & Information Association of New Zealand Aotearoa, Movements for the Internet Active Users, NZRise, NZOSS, OpenMedia.org, Public Citizen, Public Knowledge, Royal New Zealand Foundation of the Blind, Scoop, Tech Liberty NZ, TechDirt, Tuanz, Tucows, and TradeMe.